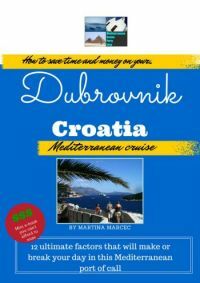 "This list will help you make sure you see and check off the top 10 ½ Dubrovnik attractions and return to the ship without the funny feeling you missed something." We know that for Mediterranean cruise guests, days in port can get quite hectic. As opposed to other tourists – their time can be very limited. That’s why it’s important to know where to go and what to see way ahead before you even get to your destination. This list will help you make sure you see and check off the top 10 ½ Dubrovnik attractions and return to the ship without the funny feeling you missed something. 1. 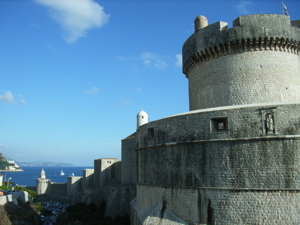 City walls – it is an essential part of your Dubrovnik experience! The walls are one of Dubrovnik attractions that don’t only give the Old Town its specific and recognizable appearance, they are there to be walked on! The vistas on both the seaside and the town-side are just magnificent. The bird’s eye view will give you a nice insight into some spots normally hidden to an average, street-walking tourist. Read more about this must see Dubrovnik attraction here. 2. Stradun – this is one of the most beautiful and most romantic streets in the world. This is the widest street in the Old Town and connects the main entrance into town with the Old Harbour. Cars have no access here so the only thing you can run into are little kids happily running around, a chihuahua that escaped from someone’s purse, or pigeons. This is a perfect place to slow down, window-shop, taste some gelato, sit down for a tasty and aromatic cappuccino… your only job here should be… to enjoy yourself! It is definitely one of our favorite Dubrovnik attractions! 3. Franciscan monastery and the Old Pharmacy – the entrance into this complex lies at the very beginning of the Stradun, so don’t forget to return to it if you’d like to walk down the Stradun first. You will definitely enjoy walking around its beautiful and tranquil cloister built in the 14th Ct. The cloister is framed by a beautiful colonnade… pay attention to the capitels of the columns, each one is different and portrays human heads, grotesques, animals and floral motifs! 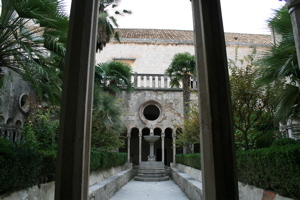 The Old Pharmacy within the monastery complex is another one of Dubrovnik attractions. It was founded in 1317, which makes it the 3rd oldest in Europe! The amazing thing is it has been continuously operating until the present day. You can go in to buy something, but keep in mind photos aren’t allowed! In the complex of the monastery, you can also visit a collection of liturgical and art objects. This is where you will also have a chance to see the inventory of the Old Pharmacy. The most recent “exhibit” in the museum is the hole in the wall created by a mortar during one of the shelling attacks on Dubrovnik in the 1990s. Makes you think! The Franciscan monastery is also very famous for one of the richest old libraries in Croatia – the collection has over 20 000 old books, 2000 of which are old manuscripts of extraordinary value. 4. Sponza Palace – find this beautiful palace, one of Dubrovnik attractions, at the very end of Stradun. It was built in the 16th Ct and survived the terrible earthquake of 1667. First built as a customs office, this building also housed many other state offices: the mint, the bank, the treasure and the armoury. Find out more about Sponza palace here. 5. 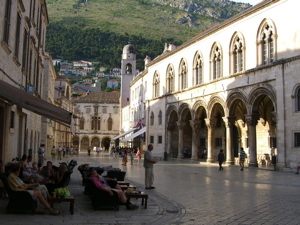 Rector’s Palace – as you reach the end of the Stradun, turn to the square on your right. The most prominent and most elegant palace on it is the Rector’s palace, the seat of power in the old city-state of Dubrovnik. This beautiful building is a harmonious mixture of Gothic, Renaissance and Baroque elements. Today, it is the Cultural Historical Museum. 6. The Church of St Blaise – also situated at the very end of the Stradun street and easily recognizable by the statue of the city’s patron, St. Blaise on its top! St. Blaise was also the protector of the Independent Republic of Ragusa. His day has been celebrated since 972. and still is celebrated yearly on the 3rd of February. On that day, St. Blaise's relics are paraded down Stradun street in a big festive ceremony. 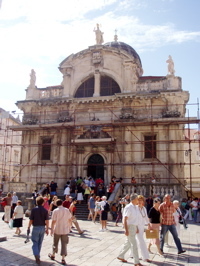 This 18th Ct Baroque church is one of the most recognizable Dubrovnik attractions. Its staircase is a perfect place to sit for a moment and just take it all in! 7. 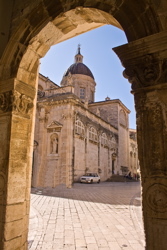 Dubrovnik Cathedral and Treasury – as you get to the very end of Stradun, turn right and go to the very end of the square. That’s where you will find the imposing Baroque Cathedral of the Assumption of the Virgin which was built on the sight of several former cathedrals that were damaged or destroyed throughout the history. It is home to a Titian painting and the Cathedral Treasury with over 200 relics. There are 138 gold and silver reliquaries and most of them were made by Dubrovnik goldsmiths from the 11th to 17th ct. The most important relics held here are the gold-plated arm, leg and skull of Saint Blaise. 8. Onofrio’s fountain… actually there are two of them! The great one and the small one. You will find the Great Onofrio’s fountain at the very beginning of the Stradun, to your right. This famous Dubrovnik attraction was built in the 15th Ct and it stands out with its structure of 16 sides, a cupola and 16 water pipes all around. It is the very end of an aqueduct that connects it with the source which is 12 km away. Its steps are a perfect resting spot. If you have a water bottle with you, fill it up with its cool water, especially if you’re headed to walk the walls. The small Onofrio’s fountain is at the opposite end of Stradun and is positioned in a little niche on a façade. You will recognize it by the dolphin decoration. 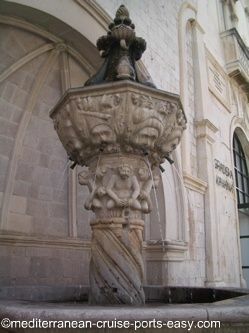 During the Dubrovnik summer festival, this fountain is part of the original setting of one of the 16th Ct. plays. 9. The Synagogue – Dubrovnik boasts a rich Jewish history dating back to the 15th Ct, which is when Jewish people came to the town. The Jewish ghetto was formed in the Zudioska street which is also the home of the oldest functioning Sephardi Synagogue in Europe today and is Europe’s second oldest synagogue after Prague. The synagogue is still active, but only for some Jewish holidays. On the first floor of the synagogue building there is also a little Jewish museum. To reach the synagogue, start walking down the Stradun street from Pile gate towards the Clock tower at its end. A few blocks before the Sponza palace turn left into the Zudioska street. Walk up the narrow, stair-lined alley, you will find the Synagogue to your left. You can read more about Jewish Dubrovnik here. 10. 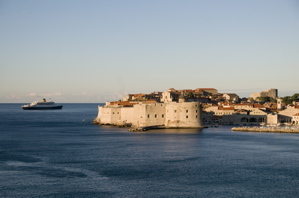 Old Harbour – a beautiful and picturesque spot, a perfect end to every Stradun walk. To reach the Old harbour walk all the way down the Stradun from its beginning at the Pile gate to the very end. There you will find passages onto the other side of the walls where the Old Harbour is. In the Middle ages, this was one of the busies ports in the Adriatic sea through which all the wealth poured into this prosperous and powerful town. Today, this is where you will find boats/ferries to the neighboring day-trip destinations like Cavtat and the isles of Lokrum and Lopud. If you are on a smaller cruise ship, tendering into town, this is where your tender boats would dock. The port is lined with terraces of restaurants, cafes and old ladies selling authentic hand embroidered tablecloths! A must see! 10 ½. The Farmer’s Market – this attraction gets a ½, not because it’s less important or beautiful, but just because it’s more active only in the mornings and you might not be lucky enough to experience it if you get there too late. 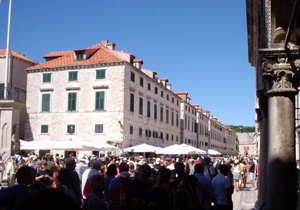 The Farmer’s market is one of our absolute favourite Dubrovnik attractions. 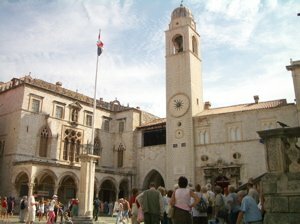 Here’s instructions on how to get there: when you get to the Old Town from the port of Dubrovnik, walk down the Stradun street. At it’s end turn right, walk approximately halfway down this street… and then right again! 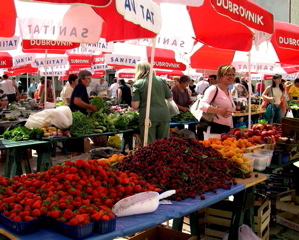 On the Gundulic square you will see a sea of red umbrellas hiding stalls full of fresh veggies and fruits. Watching the locals haggle with the little old ladies for the price of the tomatoes that were picked up in the garden that morning is priceless. Tip: buy some fresh or dried figs, candied orange peels or almonds to snack on as you’re walking around! Enjoy them and just pretend you’re Mediterranean! This is also a great spot to find superb olive oils, home made brandies and herbal remedies! If you want to take a bottle of something (alcohol) back home as a souvenir, just remember security on the ship will most likely take it from you when you get on board, just to deliver it back to you on the last night of the cruise. 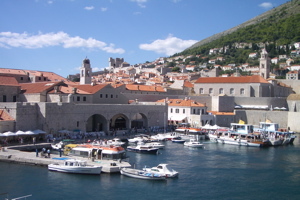 Hotels in Dubrovnik - Planning to stay in Dubrovnik in future? HotelsCombined.com allows you to instantly search and compare room availability and prices from all major travel websites! 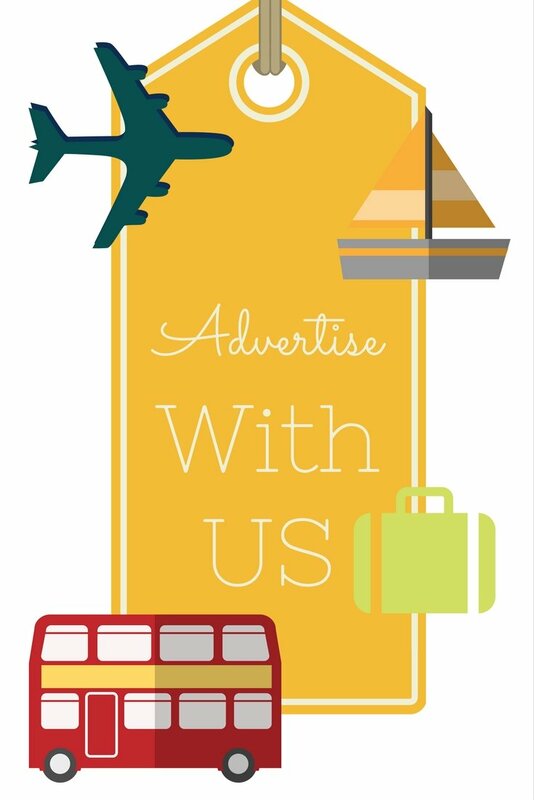 Viator Dubrovnik Tours and Shore Excursions - Compare prices to the ship offered shore excursions and book your own tours online!